5L290-K FHP V-Belt | Light Duty 5L-290 V Belt, Consumer Brand. 5L290K FHP V-Belt with Kevlar/Aramid Reinforcement. 5/8” W x 29" Overall Length. Consumer Brand (belt number printing may vary). 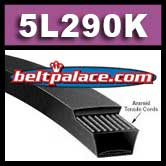 GATES 3290/5L290 Truflex V Belts (light duty). Classical B26-K (BK26) V Belt on light duty applications. Troy Bilt Model 15012 belt (P-W5L290). Replaces Troy Bilt 1902325, 97133, W5L290, and W5L290SPL belts.